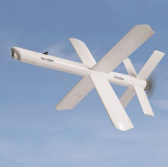 UVision Air has showcased its extended-range loitering platform at a demonstration in southern Israel to validate the system’s tracking, lock-on, target engagement, mission-abort and other capacities for operational scenarios. The company said Monday Hero-400EC system is equipped with an updated electric motor built to provide low-speed loitering and high-speed transit capacities at lower acoustic and thermal signatures. Noam Levitt, CEO of UVision, said the platform combines high-precision attack and intelligence, surveillance and reconnaissance capacities that can help field forces engage a multitude of immediate threats. Hero-400EC also features a multi-purpose high-explosive warhead as well as an aerodynamic cruciform designed to boost terminal engagement accuracy when engaging moving targets and targets in confined urban environments. The platform can be rail-launched or deployed through a modular multitube canister and operated by a single controller.